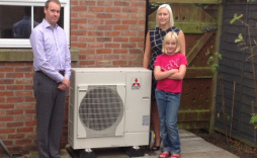 “In July 2014 I looked into replacing our oil central heating with a heat pump. I contacted a couple of local companies and they both visited and gave me a quote and information. Paul Wiseman and Alan Bolton from Safegas came. They were both very knowledgeable and knew what they were talking about. They gave sound advice and helped with information about getting a government grant. When they came to install they were very professional and had the works completed in five days. After our first winter we have found the house has always felt warmer, the running cost is lower than oil, without the inconvenience. We have always had plentiful supplies of hot water. “We had issues with our existing gas fired heating system, which was old, failing and inefficient. Safegas Limited was recommended to us via HomeServe. After contacting Safegas, we arranged a visit by their Technical Director Alan Bolton. Alan was very professional and friendly, and carried out an initial review of our requirements focusing on a replacement gas fired system. We then received a subsequent quote for a replacement gas boiler. 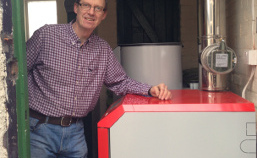 At this point Alan raised the possibility of a biomass system as an alternative and its advantages and associated options including the Renewable Heat Incentive (RHI). As a management accountant (ACMA) the advantages of the proposed system with RHI payments in terms of cost, payback and environmental advantages seemed to be blindingly obvious. We decided to progress with the biomass option. Safegas arranged a prompt and thorough survey of the space heating requirements, including heating control and radiator upgrades, clearly describing and documenting this process. The work was carried out by a team of engineers over five days before Christmas. They were efficient, worked exceptionally hard and were always polite and helpful. Some of the work was clearly quite technical, for example the heating controls and thermal store links, with separate phasing to different floors, which is proving to be exceptionally useful. I should also mention the care and help provided by the management, administrative and finance staff who have been polite, professional and extremely helpful throughout the whole process. “From the initial enquiry with the Safegas marketing team in July 2014, the central heating system using an air source heat pump was designed and installed in less than three months. The surveys, design, installation and commissioning were carried out in a first class, professional manner. The planning and programming were effective and efficient and they kept us fully informed of progress throughout. The installation was started and completed on time by highly competent and directly-employed staff who were courteous and professional. The guys were extremely tidy throughout and there was no disruption to the household. “From the first contact I was dealt with in a professional, friendly and helpful manner. Alan Bolton came to survey our property and sort out a quotation to do the work. Paul Wiseman then took over and assisted me in claiming my government grant and sorting out the finer details of the installation. A date was set for the installation which was estimated to take two days. Two safegas engineers came on the agreed date and worked very hard to meet the planned two-day installation. They were very professional and tidy when doing the work. How we would operate the thermostats was explained in detail, and the engineers set it all up for us at the temperature and times we requested. We changed from oil to air source because it is much cleaner and hopefully more economical over a period of time. Our oil boiler was due to be replaced so we thought it was a good idea to change to air source now. Air source also requires less maintenance annually which reduces the service cost. 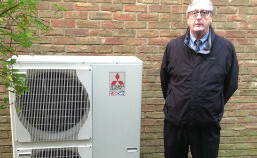 “Safegas were not the first company we spoke to about heat pumps but they were the most credible. Alan Bolton involved us in the design of the system throughout. Particular attention was given to ensuring that the radiators we planned on replacing would fit without any re decoration of the walls and the absolute minimum displacement of the floor coverings. Our system was installed over a three day period and ran to plan. The heat pump works as expected and is quiet and unobtrusive. Our house is warm 24/7 and we anticipate a significant cost saving over LPG. “Having had our Green Deal Assessment, Safegas then duly advised us on what our subsidy would be from the government. They then gave us a quotation and presented our fuel savings to us, which were to be in the region of 30 to 35%. We then asked Alan Bolton back to our home again to run through the finer details and retake us through exactly how the new system would work. We then made the decision to go ahead with the air source heat pump and arranged for Alan to come back a final time and confirm the new radiator positions before the work commenced, which he duly did. Prior to having the heat pump installed we thought that there would be quite a bit of disruption and upheaval but that wasn’t the case. Over the three days it took we couldn’t believe how non-disruptive the installation was. Each day you could hardly tell that the guys had been here, other than we had new radiators and a pump in our garden.